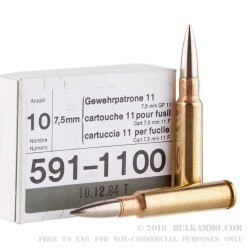 Made to the Swiss GP11 standard, which was the standard cartridge of the Swiss military for much of the Cold War, this 7.5x55mm ammunition from RUAG provides excellent accuracy and power. Each cartridge fires a 175-grain bullet at a muzzle velocity of 2,560 feet per second. This 480 round case contains 48 boxes, each of which holds 10 rounds. 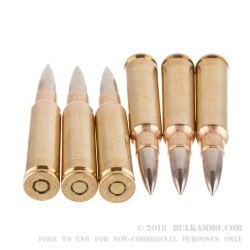 Note for reloaders: The cartridges use brass cases and non-corrosive Berdan primers. Reloading methods for Boxer primers will not work with these cases. RUAG Ammotec is an ammunition company that focuses on defense and law enforcement products. Descended from notable Swiss firms such as RWS and Dynamit Nobel, the company currently operates in the US, Germany, Sweden, and Hungary as well Switzerland. The original service ammo for Swiss rifles: the Langgewehr 1896/11, Infanteriegewehr 11, Karabiner 11, Karabiner 31, and Sturmgewehr 57. You might know them as the 96/11 long rifle, 1911 long rifle and K11 carbine, the K3, and the Sig PE57. 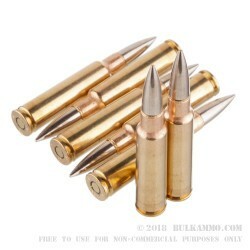 This is match-grade ammo, non corrosive, berdan brass, cupronickel jacketed boat-tailed low drag bullet. 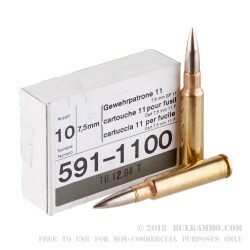 this is top grade ammo at the best prices on the net, (that ship to CT). I ordered a case of GP11 based on above description. It was Box primed brass when I ordered a week ago. It changed to Berdan primed brass about 2 days after I sent the order in. Also, I was expecting 92T LOT ammo -like in Picture above- but received a case of Jan 81 LOT ammo. But, I am not complaint too much since the price was not bad after all..